Caters to businesses that do not bill tax, businesses that bill one level of tax and businesses that bill 2 levels of tax (e.g Canada). Prepare simple financial reports and charts like business income/ expenses reports. Add a logo to your documents. Powerful search and find options to find your past invoices and quotes. Able to insert Paypal links to emailed invoices to allow customers to pay invoices over the internet. Prepare and manage recurring invoices. Import your customer and product lists from MS Excel, MS Outlook Expresss Address book, text files (CSV) or other formats. 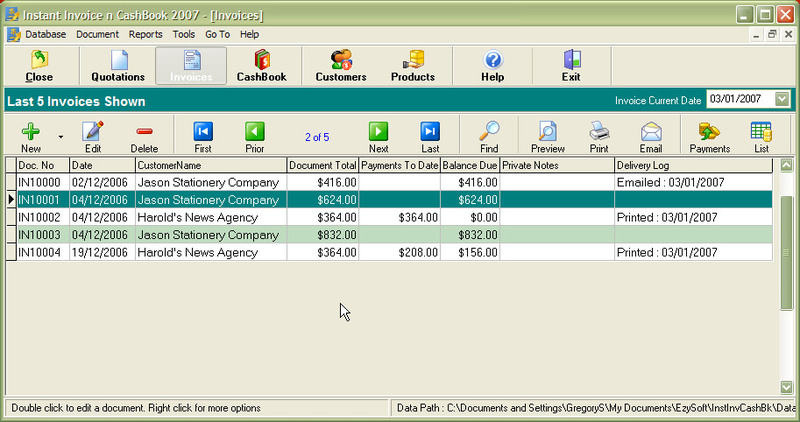 Able to able to export your invoice listings to a comma or tab delimited file for pasting to MS Excel or other tools.